Mushrooms come in many different shapes and sizes. They also range a lot in terms of their availability and price. The kind I find readily available in my local supermarket are white button mushrooms. They tend to be affordable and versatile, and use them in many of my recipes. Those with bigger caps are easy to stuff, and I’ve experimented with couple of different types of stuffing, like the mashed potatoes and corn tortilla, Mexican-flavor inspired stuffing. Small and imperfect mushrooms are great for chopping up, and using for recipes like a quiche or a stews. White button mushrooms are also a common ingredient in my burgers and my homemade ground beef substitute, where I grind them and add to the burgers for color, texture and flavor. In many aspects, white button mushrooms and baby portobello (crimini) mushrooms are interchangeable, and I may use one or the other or both depending on which variety looked best at the store that day. Crimini mushrooms had a more woody, deep and rich flavor than white button mushrooms, but the differences are not major, so they tend to cook and taste about the same. They also cost about the same as well, and tend to be on sale at the same time! Once in a while I lay my hands on really large portobello mushrooms, and those I like to grill and transform into portobello steaks. They look and taste amazing, and make for an easy and healthy dinner. The price tag on these is a bit larger, and you do have make more of them to feed the crowd, because one portobello steak is usually not enough. But, they are absolutely irreplaceable if you need to make a great grilled steak vegan style. What makes mushrooms an essential staple of any vegetarian, vegan and plant-based kitchen is their flavor, and a large amount of umami, the flavor associated with perception of meatiness. The naturally occurring chemicals behind this umami flavor are glutamate and guanylate (plus couple of others), and mushrooms have large amounts of them, none more than shiitakes. Shiitakes are native to Southeast Asia and have been used in local cuisines for centuries, either fresh or dried. They are also now becoming more commonly available in US supermarkets, although they tend to be more expensive. Luckily for me, I recently ran into a pile of loose shiitake mushrooms in my store that were plump, fresh, large and reasonably priced. I bought about a pound (half a kilo) of shiitake mushrooms and decided to try making a Shiitake Mushroom Stroganoff. I am sure this recipe would work with other types of sturdier mushrooms but shiitakes, becasue of their sweeper umami flavor, work exceptionally well. 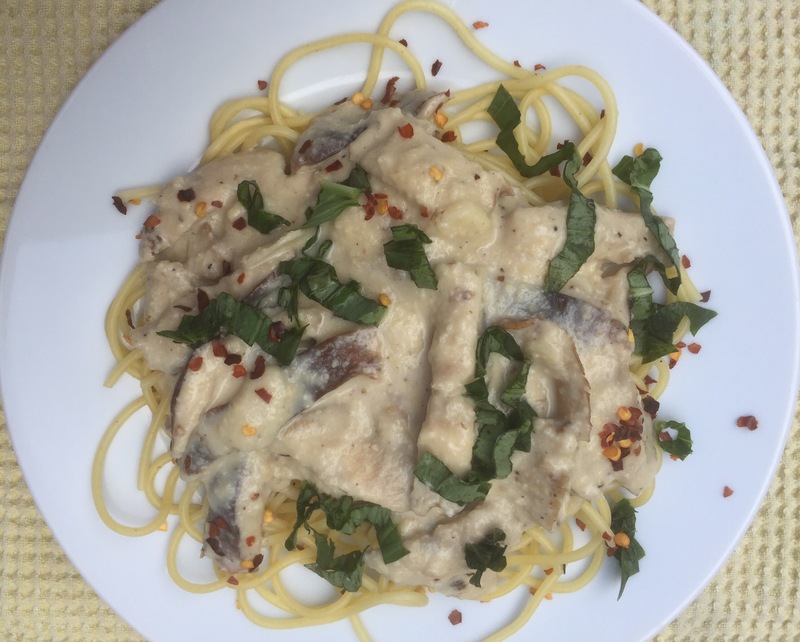 I paired Shiitake Mushroom Stroganoff with some spaghetti for a satisfying dinner. You can make the dish gluten free if you need to by the right kind of pasta. Alternatively, you can serve with quinoa for a higher protein meal. Cover the cashews with water and let them soak for at least 30 minutes, best overnight. The next day, rinse the cashews and place them into a blender. Add almond milk and tapioca starch, and blend until creamy. Set aside. Clean the shiitake mushrooms to remove the stems and any signs of visible dirt. Rinse them with water, pat dry with some paper towel and slice the caps intro strips. Peel the garlic cloves and slice them very thinly. Place a large pan over the medium heat and add olive oil to it. When the oil is hot, add mushrooms and garlic to the pan. Stirring frequently sauté the two for 5 to 10 minutes, until mushrooms have softened. Mix in the freshly ground black pepper to taste, then add cashew cream sauce and fold everything together. Simmer for another 10 to 15 minutes, until the sauce is rich and thick. Pour over your favorite pasta, quinoa or polenta, and enjoy with a sprinkle of crushed red peppers and fresh basil! Fully loaded vegan mushrooms are finally here! Last time I went grocery shopping large white stuffing mushrooms were on sale and they looked so inviting that I had to have them. For most vegetarians and vegans mushrooms are a common ingredient as they add that elusive umami flavor to dishes. I used them fairly often and have featured them in my Vegan Stuffed Pepper recipe. This time around it is the mushrooms that are getting stuffed, and the stuffing I decided to go with is yummy, silky smooth and creamy mashed potatoes. Additionally, just to kick it up a notch I made some Cashew Sour Cream by Oh She Glows to add a bit of flair. Finally, sun dried tomatoes on top are for loveliness, color and for a bit of sweetness. There are really two tricks here. One is to bake the mushroom caps on their own, and the other is to use a blender to purée the potatoes. To get your mushrooms going I first remove the stems, but I don’t throw them away as I use them as a part of the stuffing. I place mushroom caps their open ends up on the parchment paper (or foil) covered baking sheet and put them in the oven for about 20-30 minutes. The point is to get the caps soft and to let the mushrooms release excess water. At the end of the baking each mushroom cap should be filled with brown liquid (see below), and I dumped this liquid out. Transfer your mushroom caps into a greased baking dish with tall sides that will help with making sure no stuffing gets out while baking. Using a blender to purée the potatoes makes them into a creamy heaven that is perfect for stuffing. I would not recommend using the blender method if your end point is mashed potatoes because what you get is quite smooth, but for topping something like a Vegan Shepherd’s Pie or stuffing these mushrooms this method is perfect. All in all these Vegan Mashed Potato Stuffed Mushrooms with Cashew Sour Cream are perfect as an interesting appetizer and entertaining, as well as a really great dinner in their own right. The amount of mushrooms I used is huge and it was definitely meant for sharing and enjoying in a large group, so feel free to scale down accordingly! Clean the mushrooms gently with a piece of paper towel. Separate stems from the caps. Keep the stems for later. Place caps, hole side up, on a parchment paper lined baking sheet and bake for 15-20 minutes, until the mushroom caps are soft and full of clear, brown liquid. Take the mushroom caps out the oven, discard the liquid and place them into a deep baking dish well sprayed with the cooking spray. Put aside. Peel the potatoes, chop them into small cubes and boil until cooked through which can take 15-30 minutes depending on the size of your cubes. Drain the water and let the potatoes cool for 15 minutes. Add almond milk and blend until potatoes are smooth. Chop scallions, using both the green and white parts, and mushroom stems finely. Spray a frying pan with cooking spray and sauté scallions and mushroom stems fro 5-10 minutes. Add sautéd scallion and mushroom stem mixture to the potatoes. Mix well. Spoon the potato mix into mushroom caps and top with a spoonful of cashew sour cream and few slices of sun dried tomatoes. Return to the oven for another 15 minutes.